In our Park Spotlight series, we take a closer look at Houston’s vast array of public recreational areas to shine a light on hidden and not so hidden gems. This week we’ll be spotlighting Eleanor Tinsley Park. Join us as we take a trip through Houston, park by park. Located immediately west of Downtown within Buffalo Bayou Park (between the 18 to 3600 blocks of Allen Parkway), Eleanor Tinsley Park delights Downtown visitors with skyline views, adjacent running trails, and lush green hills. 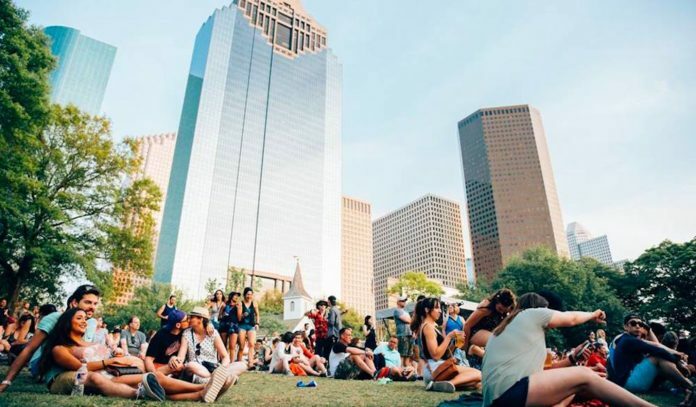 Along with the adjacent Allen Parkway, it’s possibly best known as the host location for beloved annual festivals like the In Bloom Music Festival (formerly Free Press Summer Fest) and the Freedom Over Texas 4th of July celebration. Named in honor of the late City Councilmember and civic activist, Eleanor Tinsley, the popular outdoor space includes the park’s signature lawn, the covered awning that boasts the official name of the Bud Light Amphitheater, the open-air Nau Family Pavilion, and a trail providing a direct connection to Sabine Promenade, amongst other amenities. As part of the larger Buffalo Bayou Park, it’s in close proximity to the Lee and Joe Jamail Skatepark, the Shady Grove Victim Memorial, Henry Moore’s Large Spindle Piece sculpture, the Houston Police Officers’ Memorial, Glenwood Cemetery, the San Felipe playground, jogging trails, and a sand pit which can be used for volleyball. It offers striking views of the the Downtown skyline and you’re likely to see photographers, professional and aspiring, framing their own special shots at most times of day. Visitors should note that this area is an active destination no matter the time of day due to its proximity to many of Buffalo Bayou Park’s most popular amenities and the designated parking area fills up quickly. Note that this parking lot fills up most quickly when young professionals and other active adults get off work, and take to the trails, on weekdays. Hours: Dawn to dusk daily. Parking: Free lot and street parking is available in the surrounding area, but fills up quickly. Observe posted signage or you will get a parking ticket.